Great Villa with ocean view, very private. 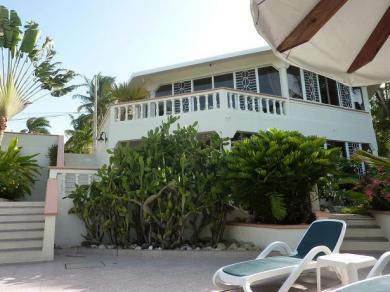 The main house has a total of 3 bedroom, one is presently used as an office, 2 bathroom, large open living and dining area with full view of the ocean, balcony. The pool area is a dream with large terrace and surrounded by tropical trees...The ground floor is a large self contained one bedroom apartment (80 m2) with private entrance and terrace... On the same property is a small guest house (40 m2) with one bedroom, one bathroom, kitchenette living/dining area with private entrance, great for rentals.